London's boroughs have backed a Bill seeking a city-wide ban of free throw-away shopping bags. In a public consultation by London Councils - representing all 33 boroughs - almost 60% of respondents supported an outright ban on plastic bags. The London Local Authorities (Shopping Bag) Bill is due to be deposited in Parliament on 27 November. 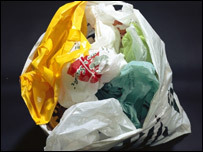 About 1.6bn bags are used in London every year and only one in 200 of these is recycled, said London Councils. Merrick Cockell, of London Councils, said the aim was to rid the city of the "environmental blight" of plastic bags. He said: "As a society, we need to do far more to reduce the amount of waste we are sending to landfill. "I urge all Londoners to voice their support to their MP and back the Bill once it gets to Parliament." But David Tyson, of the Packaging and Films Association, said the move would risk damaging London as one of Europe's premier shopping and tourist destinations. He said: "Shoppers need carrier bags for impulse purchases and the majority of supermarket bags are re-used as bin liners or to collect dog droppings." Mr Tyson claimed that action against carrier bags in Ireland had resulted in "greater environmental impacts" and the Scottish Parliament had abandoned similar plans as there was no proven environmental benefit. Meanwhile Barry Turner, of the Carrier Bag Consortium, said it was "a serious error of judgement based on spin not science". Mr Turner said: "Government experts agree there are unintended consequences in taxing or banning carrier bags." He said that to take forward this proposal "on the basis of less than 2,000 public votes" was irresponsible. Should there be a nationwide ban on free throw-away shopping bags?